The Smart Hubs smart local energy systems project starts with the premise that "you can't buy a Smart Grid". The plan is not only to procure a Smart Local Energy System in West Sussex, but also to develop a new procurement approach for local Smart Grids that can be replicated elsewhere and be financeable. The Smart Hubs project will deploy multi-scalar, multi-vector open-architecture smart local energy systems across heat, power & transport with interoperable Internet of Things layers as part of a blueprint for future local energy Smart Grids. Although marine source heat pumps will be the backbone of a new district heat network, it is recognised that to achieve the UK's carbon targets "heat is only half of the problem". The electrification of heat opens up opportunities not only to balance the national grid, but also to use demand side response techniques at the local level to balance local energy supply and demand. The Smart Hubs Project brings together cross-sector supply chains to deliver integrated energy solutions at different scales to meet the energy systems challenges of achieving a low-carbon economy: secure, affordable, sustainable energy. The heart of the network is the efficient use of renewable energy based on the recycling of solar heat in the sea (transferred from the Caribbean by the Gulf Stream) to heat buildings on the network in winter. Heat pumps are used to transfer heat to buildings in winter instead of generating heat afresh by burning fossil fuels. 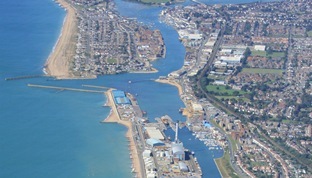 ICAX has developed heat pumps which can deliver high temperatures so that they can be used at the heart of a Fourth Generation Heat Network to deliver heat to buildings on the network in Shoreham Harbour. ICAX will also examine the feasibility of incorporating a fifth generation heat network into the Smart Hub. Balancing the supply and demand for heat through the seasons is mirrored by balancing the supply and demand for electric power by shifting some of the demand from times of peak consumption (by day) to times of excess supply (by night). Vehicles can be free from emitting CO2 and NO2 if propulsion is based on an electric drive train. Battery electric vehicles need time to charge and electric charge points, which will be installed in Shoreham. Fuel cell electric vehicles can be charged quickly at hydrogen refuelling stations, which will also be installed at Shoreham and Horsham. Demand side response is used to shift the timing of electric demand from hours of peak demand to times of surplus supply. DSR requires a bi-directional energy grid to signal when prices are low to trigger additional use (and to signal when prices are high to inhibit use). A Virtual Power Plant (VPP) will be installed to link generators and users of electricity, with smart controls and storage capacity to bridge the gaps between peak supply and peak demand. Hundreds of homes, schools and council buildings will have solar panels, batteries and electic vehicles installed and linked together to demonstrate the advantages of smart technology which is designed to cut energy costs by 10%. ICAX is also addressing the growing problem of air pollution: the marine source heat pumps will provide heating without employing combustion or releasing any gasses on site. Advanced Infrastructure which is the lead partner in the Smart Hubs SLES project. West Sussex County Council which, in co-ordination with Adur and Worthing Councils, will establish a multi-vector local smart grid in Shoreham-by-Sea.